How can I access MeetingSquared? How does MeetingSquared work in Office 365? How do you load the MeetingSquared app? Can I use MeetingSquared out of the office and offline? How do I get a tablet app? Will MeetingSquared work with multiple accounts? Can I choose to share my annotations or to keep them private? On which mobile platforms is the MeetingSquared app available? Can MeetingSquared users choose whether to access their meeting on a laptop or a tablet? How do I set the MeetingSquared 365 app from the store? MeetingSquared is a digital meeting management system putting all your team’s meeting information in one place with a structured agenda where previously there were multiple emails, attachments, calendar entries and conference call details. It is available for Office 365. MeetingSquared can be viewed in almost any web browser* on any laptop, mobile device or personal computer. For the Office 365 app, all your information will be stored in your local, secure Microsoft Azure data centre. For information about all options, please contact us or speak to one of the sales team. Users log into their Office 365 account. From there they can click through to the MeetingSquared interface. Data is stored in the SharePoint directories. When it’s required, MeetingSquared provides a view of the data stored in these directories. When a user makes changes, these changes happen in the SharePoint directory. Download the app by clicking ‘Add’. Once downloaded, go to the site contents screen where the MeetingSquared app has been deployed. By clicking on the MeetingSquared app logo you will be taken to the MeetingSquared interface. To always have the app part as a clickable button from the home screen, go to the home screen of your SharePoint site, click on ‘edit’ in the top right corner. Click on the ‘insert’ tab, click on ‘app part’ and choose MeetingSquared from the list. For any problem at all you can call our Support team any time. It doesn’t matter what time it is, if you call us we promise to get back to you as soon as possible (our specific SLA is within 2 hours but it is usually more immediate). We also have an online chat which is manned 8am – 5.30pm (UK time) available from MeetingSquared or our website MeetingSquared.com, and an email support@meetingsquared.com. No matter how minor the problem is, if it is a problem for you, we are on hand to sort it out. We make the set-up as easy and as smooth as possible. The MeetingSquared app for Office 365 users, is just a case of downloading the app from the store to get it working within your SharePoint environment. Yes, you can access MeetingSquared app at any time and from anywhere. If you don’t have wifi, you can still access MeetingSquared app to see your meetings, decisions etc. If you have wifi, as soon as you are reconnected any annotations you have made will be automatically synced back to the server and saved. By clicking on refresh, any new documents added to the meeting will be downloaded to the app. To ensure your documents are up-to-date it is recommended that you go online as often as you can and refresh your meetings, so new information can be updated. Any changes made to the meeting agenda, documents or links will be updated immediately in the web browser and tablet apps, provided the users are online. The user just needs to touch the refresh button within the app if they are already in the meeting. Controllers can also update the PDF pack by clicking to update this with the changes and sending this out again. You can download the tablet apps for free. For your iPad from the iTunes App Store. For your Windows tablet, laptop or computer from the Windows Store. For your Android tablet from the Google Play store. No, all updates are free. When a new version is available, as a user, you will be notified. 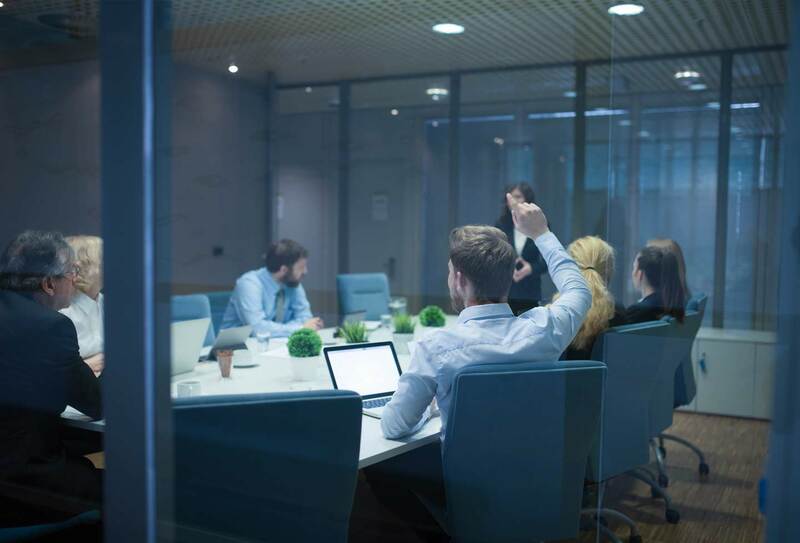 If you sit on multiple teams, then provided each has a MeetingSquared licence, you will see all your boards, committees and meetings for each in one screen. Yes, both your login details and all your data is encrypted (AES 256-bit SSL). For more information about security please contact info@meetingsquared.com. There are measures that individuals can take to protect their information, such as having a password on the computer or tablet that they are using, and keeping it locked when not using it. Login details are never stored on disk. There are minimum requirements for the complexity of passwords. Clients have the ability to set their own password complexity requirements. For added security, you can choose to have two-factor authentication. This means you have two steps to your login, your own chosen password, and a one-time randomly generated one, which you receive on your mobile or smart phone. The MeetingSquared app is available for Android, Apple and Windows tablets. 7 languages are available in the iPad app: English, French, German, Dutch, Spanish, Portuguese and Polish. 6 languages are available in the Windows app: English, French, German, Dutch, Spanish and Polish. 5 languages will be available in the web view from 2017: English, French, German, Dutch and Spanish. The Android app is currently only available in English, if you would like to see it in other languages please ask. You can access MeetingSquared on any web browser* so if you don’t want to use a tablet, you can use a laptop in the meeting. The PDF pack means that if someone wants to view or print all the meeting documents they also have this option. *For Internet Explorer we recommend using IE 10 or above, as lower than this there are some limitations to functionality. The managed tablet plan may include mobile data and enforced security policies including compulsory passcode locks, remote wipe, and multi-app encryption depending on which option you choose. Please check with a member of the sales team or email info@meetingsquared.com to see if the managed tablet service is available in your region. You can set up Touch ID on your iPad by tapping Settings > Touch ID & Passcode. This feature is only available on the iPad Air 2 or iPad Mini 3 tablets (also iPhone 5S and later). You need to set up your fingerprint by touching the Home button, which is the dimpled button in the centre of the shortest side of the iPad. You have to do this several times to set it up. If you want the MeetingSquared app to use the Touch ID password recognition to access your site instead of your password, you need to have set up Touch ID first. Then open the MeetingSquared app, and you will need to enter your password in the usual way one last time, then a pop-up will ask if you want to use Touch ID from now on, select ‘Yes – enable now’. Exit the app, don’t sign out, just swipe upwards to see all apps open and swipe the MeetingSquared app upwards to close it. Next time you tap on the MeetingSquared app to open it you will see a pop-up for Touch ID for MeetingSquared with a fingerprint icon. At this point, gently press your finger on the dimpled Home button (don’t press the button). Or if you want to use your normal login, select that option from the pop-up. Go to the Office 365 for SharePoint store and search for ‘MeetingSquared’, or click the link in the website. If you are an administrator you will be able to purchase the app by clicking ‘buy’. Once you have purchased it, go to the site contents screen for the site to which the MeetingSquared 365 app has been deployed. By clicking on the MeetingSquared app you will be taken to the MeetingSquared 365 custom interface. Once in the MeetingSquared app click to add a ‘Meeting group’. Once you have done this you will be able to click to add a meeting with a date, time, location etc. Then start building the agenda by clicking add agenda.